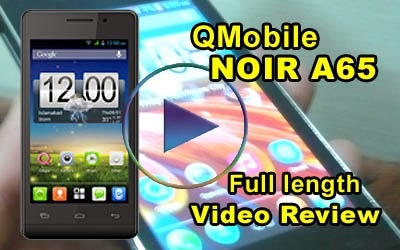 QMobile NOIR A65 is a slim phone which comes with an affordable price tag of 10,800 . It has a 4.0" WVGA display and 1.2 Ghz processor . It has 512 MB RAM and 4 GB internal memory . On the front side it has three capacitive buttons and front camera in the side of a head phone . On the back it has a 3 MP Camera speaker grill and flash light . Full length review of QMobile NOIR A65 in Urdu from Bilal Saeed on Vimeo.